Is This The Rudest Question In The History Of The Chase? The Chase is known for its tongue-in-cheek multiple choice questions which have entertained ITV‘s family audience over the years. 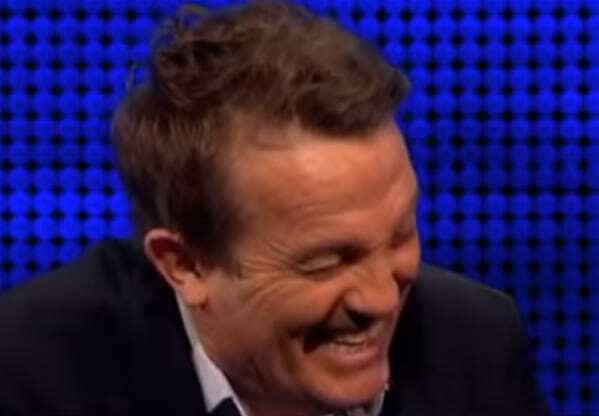 Yesterday, however, one game show participant got a taste of televised stand up when a question raised some eyebrows and had Bradley Walsh in stitches. When the options were revealed, hilarity ensued. The contestant was asked to select one of the three options: Abbot’s Gold, Bishop’s Sunshine or Vicar’s Blue Veined, at which point the audience began to titter. It was the one I’d be most interested in trying. Even the usually steely Chaser, Ann – otherwise known as The Governess – joined in and cracked a smile. But she’ll be used to the almost SFW content now, with innuendo cropping up almost daily. Perhaps the writers are more concerned with chasing YouTube clicks than intellect. Either way, I’m glad for the mildly amusing knob joke and eagerly await more cheese-related banter on daytime television.